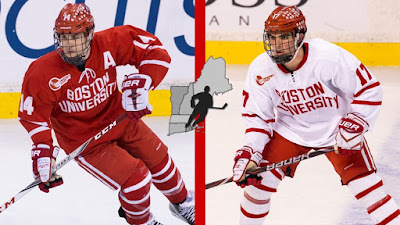 Junior Bobo Carpenter and sophomore Dante Fabbro have been named to the New England Hockey Writers Division 1 All-Star team. Carpenter was tied for the team lead in points with 35 and was the top goal-scorer with 20. Fabbro was second among Hockey East defensemen with 29 points. Both were named to the Hockey East 2nd All-Star Team. 2019 recruit Robert Mastrosimone scored his 15th goal and added an assist in the Chicago Steel’s 4-3 overtime loss to Central Illinois. ► Following the conclusion of the USA Hockey NTDP Evaluation Camp earlier this week, three 2020 Terrier recruits and a prospect BU is recruiting are among the first players confirmed to have received roster invitations for the 2018-19 NTDP U17s. The committed prospects are St. Sebastian’s goalie Drew Commesso, Junior Sabres 16U left wing Luke Tuch and Canadian International Hockey Academy White right wing Dylan Peterson, a dual (US/Canadian) citizen. The prospect is Milton Academy freshman center Matt Beniers who reportedly is being recruited by BU, BC, Northeastern, Providence and Harvard. Tuch and 2018 recruit Domenic Vidoli will be participating in this year’s USA Hockey Youth Nationals. Vidoli and Culver Prep, the top ranked 18U team, will play in the Tier 1 competition in West Chester, Pennsylvania. Tuch and the Jr. Sabres 16Us will compete in the Tier 1 16U tournament in Philadelphia. Another 2020 recruit, center Josh Lawrence of Select Academy 16U, is HockeyProspect.com’s top ranked player for the 2018 QMJHL draft. The Moncton, New Brunswick native scored 83 points in 49 games. BU has received a commitment for 2019 from 6' 6" Belmont Hill forward/defenseman John Copeland. 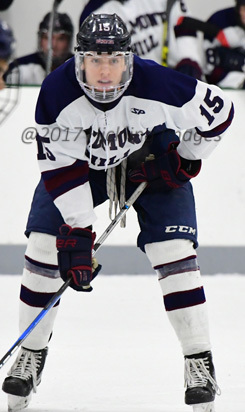 A right-shot who played forward for his first three seasons at Belmont Hill, Copeland moved to defense this season and led the team in goals with 10, adding 11 assists for 21 points and serving as team captain. He also skated for the Little Bruins in the Fall Prep League, recording seven points in seven games. Copeland will be a third generation college hockey player as his father, Todd, played for Michigan in the late 1980s and his grandfather—and namesake—skated for Harvard in the 1950s with the Cleary Brothers. Jack Eichel scored his 25th goal and Evan Rodrigues tallied his 7th in Buffalo's 6-3 loss to Detroit. 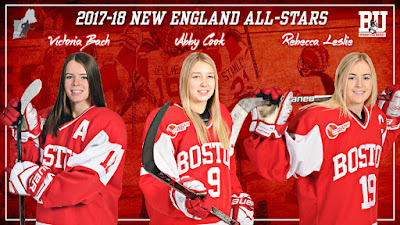 Seniors Victoria Bach and Rebecca Leslie, along with sophomore Abby Cook, have been named New England Division 1 All-Stars. Bach, who scored a program record 39 goals, was a first-team All American and a Patty Kazmaier Award finalist. Leslie, a second team Hockey East All-Star, is BU’s career assist leader with102. 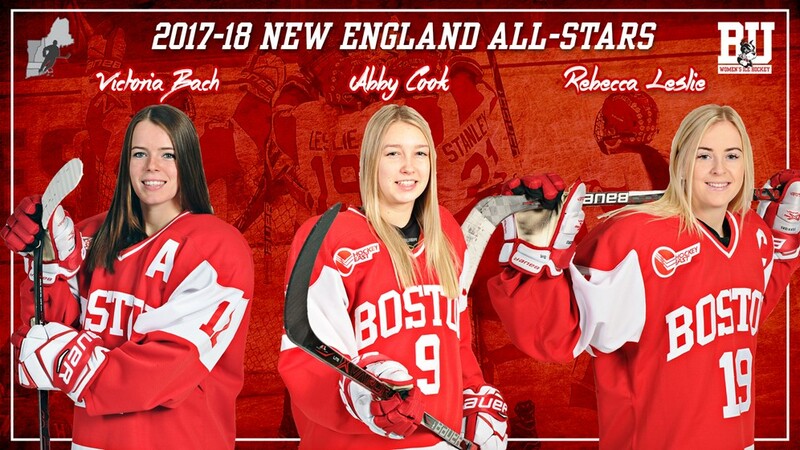 Defenseman Cook, with 24 assists, was a Hockey East First-Team All-Star.